As we look back over the past year we realize that there have been a variety of projects that we’ve been involved in and wanted to share to you the many successes. If you are looking to explore irrigation design consultants for 2018 we encourage to see what relevant projects you can compare to for your consideration going forward. We look forward to working with many of you this year! The key to working with our team is the ability to work across all levels or disciplines from architects to civil engineers and develop a comprehensive design incorporating the best in technology and water conservation. Here are a few examples that stood out as ones we completed and designed in 2017. Since opening our doors in 1994, Landtech Design has prepared irrigation design documents on over 3,000 projects throughout the world. Nearly 98% of our projects are performed with Landtech Design serving as a Subconsultant to a landscape architectural office, or an architectural firm with an LA section. Specifically with the Cummins Distribution Headquarters their design team brought in our team to be involved with the water-harvesting aspects of the project and design of the pump-station and filtration. 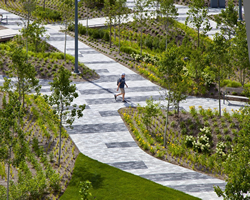 There were expansive irrigation needs on several plazas, two greenroofs, streetscape, native grass establishment and the incorporation of a weather-based controller for ongoing operations. This design was developed and approved as a LEED Gold project. 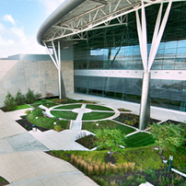 Landtech Design has vast experience with LEED projects and we pride ourselves in knowing the latest technology advancements in irrigation.